Keep your horses warm this winter with CTI Rain Buster Horse Blanket now available at Argyle Feed Store. 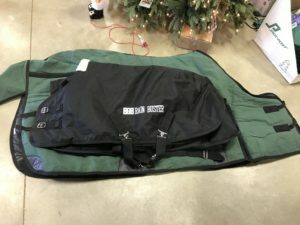 This waterproof turn out horse blanket is designed for the south so it has less fiberfill and insulation. This blanket is great because it not only keeps your horse warm and dry but it has great breathability. It also allows for great mobility. In choosing the right blanket size is important. Make sure you choose the correct size for your horse so that they are comfortable in the blanket. This brand is available in black, royal blue, and turquoise but please call the store to see what colors are in stock. Shop CTI Rain Buster Horse Blanket at Argyle Feed Store Now! This entry was posted on Thursday, December 21st, 2017 at 4:03 pm	and is filed under Horse, News & Updates. You can follow any responses to this entry through the RSS 2.0 feed. Both comments and pings are currently closed.